I awoke before sunrise, and packed my gear for the wave. This is my third visit to this amazing location. Today’s forecast calls for partially cloudy skies with a chance of thunderstorms. I was excited to photograph this rock formation set against a backdrop of beautiful clouds. My previous visits to the wave were met with cloudless skies. I strapped on my backpack, and hit the trail. It was now very familiar — hike through the wash, turn right. Hike over a sandy hill, turn right — then walk straight for many miles. I arrived at the wave around 9AM, and stashed my gear in the shade. I set out to find a different composition — something unique. I explored various angles, all the while envisioning how each lens would render the scene. I setup my camera and tried a few of these compositions. I envisioned how the light would be during different times of day. Maybe evening? Late afternoon? These thoughts were streaming through my mind. Nothing quite worked. In some cases, my lenses were not the ideal focal length. In others, there were distracting objects in the scene. The wave is a very small area, and nearly all the angles have already been captured. Deep down, I knew that my composition from 2009 was among the best I could find there. There was of course no need to re-shoot it on 8×10. Truth be told, my 4×5 gives all the resolution I would ever need — even for large prints. I soon gave up on the non-traditional angles, and placed my camera at the top of the bowl. I used a wide angle lens, and angled the rear standard to exaggerate the foreground. It was now late morning, and there were no clouds to speak of. I retreated to the shade, and enjoyed a delectable lunch of Cliff Bars, GU, and Gatorade. I read a book, and enjoyed the serenity of this location. Of the 20 permits issued for the wave that day, I only accounted for 10 people. A steady breeze swept through my location — I turned my head, and saw a solitary cloud drifting overhead. I returned to my camera to check the composition. The small puffy clouds withered and dissipated as they broke free of the mountain ridge. The uplift was not strong enough to sustain these clouds, and they were not within my composition anyway. So much for the hope of shooting the wave set against beautiful clouds. I prepared my camera, and took a “safety shot” of the scene in front of me. Since I lugged my large format gear all the way to the wave, I might as well take a shot — even if it’s not what I had in mind. Truth be told, viewing this scene upside down on the ground glass was disorienting. I placed a lot of emphasis on the swooshing white line, but failed to understand the greater balance of the composition. I now realize that the right is cut off, and I should have taken a few steps into the scene. In any case, the scene lacks interesting clouds, so it’s no big loss. I paid a visit to second wave, and debated sticking around for sunset. During the winter, the sun sets low on the horizon — in a saddle-back between two looming mountain ridges. This time of year, the sun drops behind a towering mountain, well before actual sunset. I enjoyed one last drink of water, then packed my gear for the hike back. Clouds or no clouds, it’s fun to visit the wave. Though I didn’t walk away with a photo that I will ever use, It was great to return to this coveted location, and thoroughly scout it for new compositions. This entry was posted on July 29, 2011 at 9:24 pm and is filed under 8x10, Colorado Plateau, June 2011, Photo Trips, Photography. You can follow any responses to this entry through the RSS 2.0 feed. You can leave a response, or trackback from your own site. Ben beautiful, boy I wish I was young again and could go to places like that. I commend you on your photography, your dedication to taking a great shot. I wish I had the patience to spend a day to take one picture. How are those groves formed? Thanks Bob. 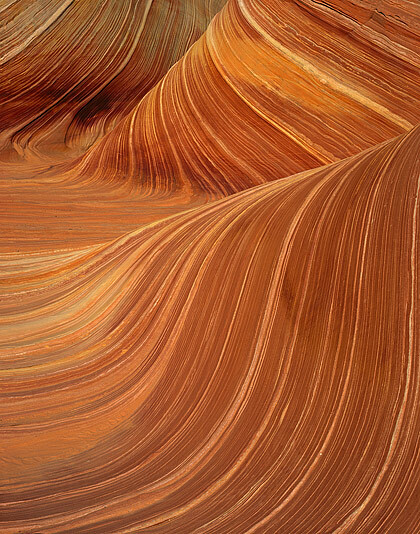 The lines in these shots are formed by ancient sand dunes that were crushed under a lot of pressure. Now, they are sandstone, but the rocks are quite fragile. I’ll post the Kodak shot as well. It has a light leak in the corner, and though it shows even more tonality, it might be too much tonality. The differences are quite substantial, but my scan of the Kodak negative film doesn’t do justice to what I really *could* do if I was trying to produce a high quality scan. I agree with Bob: your dedication in search of better weather to get this shot is commendable. They turned out fantastic. Just wanted to say I love watching your videos and reading your blog. Thanks for doing them – it’s got to be a lot of work. Thanks Steve. I’m having a lot of fun with the videos these days. The more I do this, the more I realize what sort of clips I need to film to help share the experience. It gives me something else to do while I’m out there shooting (…or not shooting). OK Ben why shoot 8×10 at all then? The 4×5 gives some very nice resolution, but the grain is more course — even on a fine grain film like Velvia 50. The 8×10 gives much finer grain, which comes in handy when doing large prints. Also, I have more cropping potential with the 8×10. I can make any composition into a panoramic, and have far more resolution than even my 6×17 medium format camera. Placing an 8×10 transparency on a light table with a loupe is an awesome experience. It’s like looking at reality. Another great coverage, Ben. 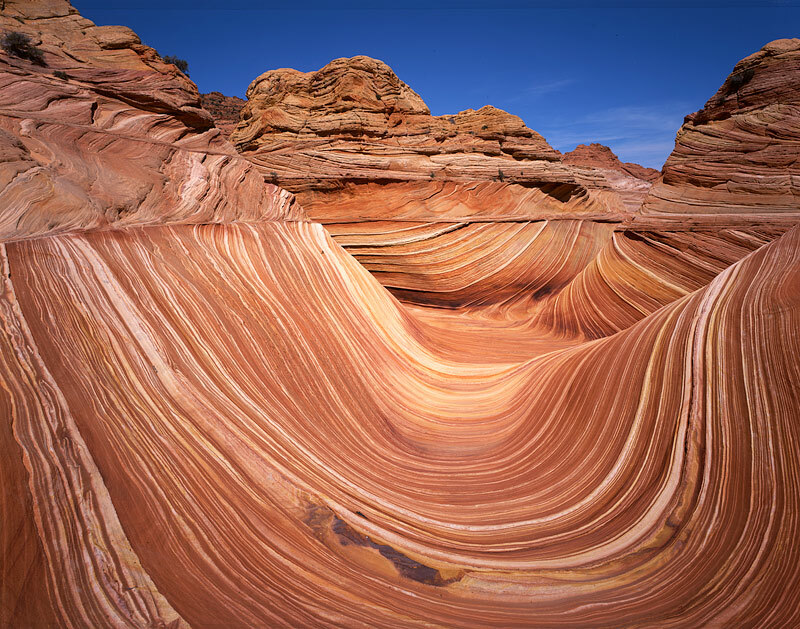 As I’ve never been to all the great places in the US but having seen so many shots of all the famous photographic spots like the wave, it’s very interesting to see what’s going on outside the frame and to somehow understand what you were able to work with composition- and light-wise. The wave definitely is a magical place and nothing close to what I’ve seen around here. Like Ron I would also be interested to see the comparison with the Portra even if you’re not too happy about the result. I’ll definitely post the portra shot as well. I have a hard time scanning it, and it does suffer from a light leak, but the shadow depth is very impressive. I’m still trying to get a feel for which shots are best on negative film, and which are best on transparency. It’s easier with transparency because I’m very familiar with how V50 will react, but I’ve taken at least one portfolio shot on negative film so far. The thing about negative film is that it creates a look that evokes memories. Perhaps this will be different when the current generation grows up having used digital cameras all their lives. must say, yours is one of the funnier and more entairtaining blogs I have encountered lately. the videos sure are key. looks like you really put a lot of heart and determination in your work. I wish you all the best and hope you’ll stay fit to schlepp all the gear around for many years to come…! Thanks Georg! I have a blast doing this, and I’m glad it shows through. In particular, the video is very fun to work with. It gives me another creative outlet while I search for the exact shot I have in my mind. I hope to kick things up a notch next year with some other locations I’ll be visiting. Thanks for following my blog!